Press Enter to detect disks. 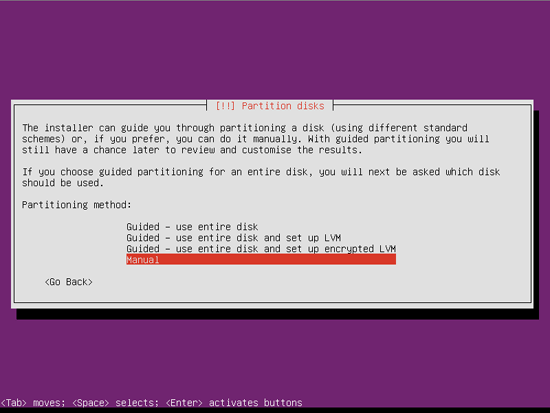 Press Enter to partition disks. Select hard disk and press Enter to continue. Mine is marked as SCSI1 and sda, wich does not have to be your case. 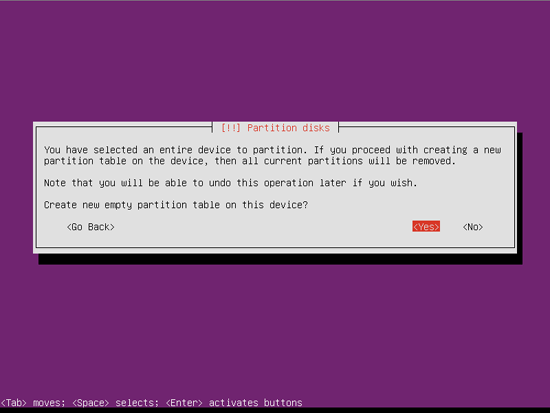 Select Yes to create a new partition table. Select msdos type as the most general one. Select FREE SPACE line and press Enter to create first partition. I'm going to use all physical partitions, so I can use max. four of them. If you need more you will have to use logical partitions, which I'm not gonna cover in this tutorial. 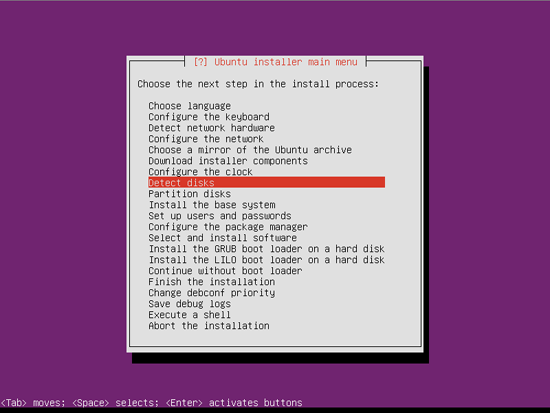 Select Create a new partition and press Enter. Our first partiton is goint to be /boot, and I don't plan to use more than 128 MB for that one. 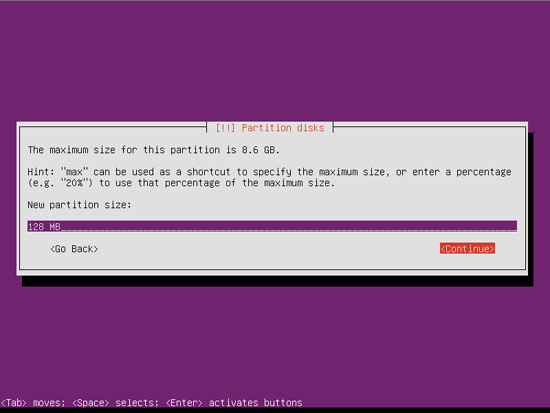 If you think that for some reason you need more space for /boot partition, enter the value you find sutable. Select Primary and press Enter. Select Beginning and press Enter. Use as: Ext4 journaling file system - as this is /boot partition we have no other option than Ext4 so we'll use that one. Mount point: /boot - This one explains it's self. Mount options: noatime - Linux records information about when files were created and last modified as well as when it was last accessed. There is a cost associated with recording the last access time. As I'm always trying to get the most performace out of my installations I will use noatime mount option (which will not record information listed before), as it may lead to significant performance improvements. Label: none - I don't use labels, which does not have to stop you from using ones. Reserved blocks: 0% - Reserved block percentage reserves X percentage (default 5) of file system blocks for root/privileged user and prevents the root/privileged user owned processes from failure when file system is 100% full. As a good SysAdmin I'm always watching (monitoring) to have enough free space on my HDD-s, so I don't use reserverd blocks. If you forget on things like that, leave this value at 5% default. Typical usage: standard - Leave the default value. Bootable flag: on - Set to on, as it is /boot partition. 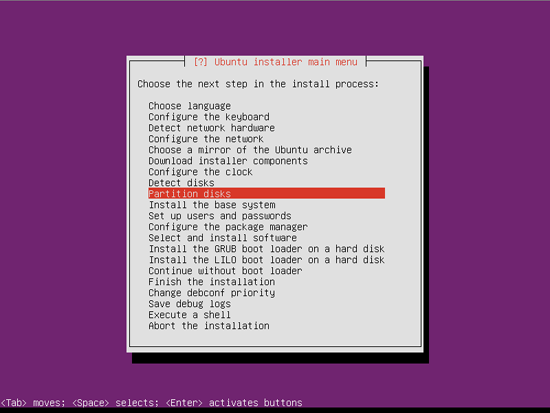 To finish the process position yourself to Done setting up the partition and press Enter.